Thanks For a Wonderful 20th Birthday Party! Thank you for joining us in celebrating 20 years in business! That's no small feat for a small, brick and mortar shop in this Internet age, and we have our loyal customers to thank for our continued success. We had a great birthday party! The whole shop was on sale and the first 20 customers received a 25% Off coupon for their next visit. Congratulations go to Marie Whitacre on winning our fantabulous 20th Birthday Basket of Goodies--that ought to keep you busy for a while, Marie! are now available! Blueprints for houses 1 through 11 are available on our website through December 24. Christmas Party & Saturday Night Sew! Join us on Saturday, Dec. 17, from 2:00 pm until 8:30 for our Annual Christmas Party & Saturday Night Sew! Wear your pajamas (it's a tradition) and bring something yummy to share. Bring a small, new, wrapped gift under $10 or so if you'd like to participate in the Merry Go Round Gift Exchange. Give us a call at 704-821-7554 to reserve your spot. 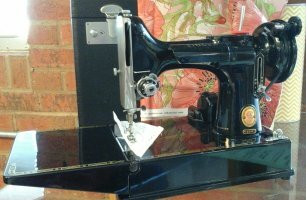 The Charlotte Quilter's Guild is raffling off a gorgeous Featherweight 221 sewing machine! This little beauty (graciously donated by Featherweight Poppy) includes the original case, a new soft side vinyl travel case, 1/4" foot, walking, assorted extra feet, bobbins, and much more! All of this can be yours for only $1! The more tickets you buy, the better your chances of winning! Tickets are available here at Quilt Patch Fabrics for $1 each. The drawing will be held on March 11 at the Guild's quilt show, "A Walk Down Memory Lane." The quilt show will is on March 10-11, 2017, 9:00-4:00 pm at the Union Co. Agricultural Center. Mark your calendars because December 16-17 is our monthly Barefoot Club Sale Weekend! Barefoot Club Members get 20% off of their total purchase (excluding quilting & classes). If you have the itch to learn how to quilt-this is the class for you! Think of this simple table runner as a small quilt; everything you learn here you can apply to any size quilt you'd to make. The techniques you will learn while making this small table runner can be applied to any size quilt, we just need something small so we can finish it in 2 days. You'll learn: how to cut fabric, basic piecing techniques, how to apply borders, basic quilting techniques, how to make your own matching binding and how to bind your project! Keep an eye out for Spring 2017 dates!